I have had a heated build platform for some time, but I havent written about it. This is a PCB headbead, its just a Standard PCB with tracks that have been made so that when its pluged in its about 1ohm of resistance. There are a bunch of options for printing onto this, some people print directly onto it with Kapton tape. I decided I wanted to print on glass. With glass you have to be careful not to create any hot spots or the glass may shatter, especially since its normal glass, in this case recycled from an old flatbed scanner. So I put a 3mm piece of aluminum on top of it as a heat spreader. This is the underside of my HBP, the thermistor is stuck to the board with Kapton tape. The wires are in a loop so that board can move in and out and not pull the wires off. The wires are only rated to 80c, so ABS is off the menu for now. The PCB holes are countersunk into the 3mm aluminum plate, so they are flush. These are bolted onto the L pieces, with the PCB sandwiched in between them. The glass must be clean and free of finger prints, I washed the glass in standard dish washing liquid as you would a plate. I then degreased it with acetone, making sure to only hold it on it edges. This just plugs into the Sanguiololu, as does the Thermistor. NB this takes 10AMP at 12volts on startup,make sure your electronics and power supply can handle it. I found that 60c is a good temperature for PLA to stick to the HBP, and they come free after the glass cools to below 50c. This does take a we while to get to temperature. Some people put their HBP on a wooden backing board. This probably keeps the heat in better, and it should get to temperature sooner. The final prints are now very flat, and the finished surface is really glossy. nice writeup. I've been trying to figure out the best way to mount this sucker to my platform. I was working with a glass top directly on top of the PCB, but even with a 15A p/s, it was taking nearly 30 minutes to get to even just 90C (I'm doing ABS). 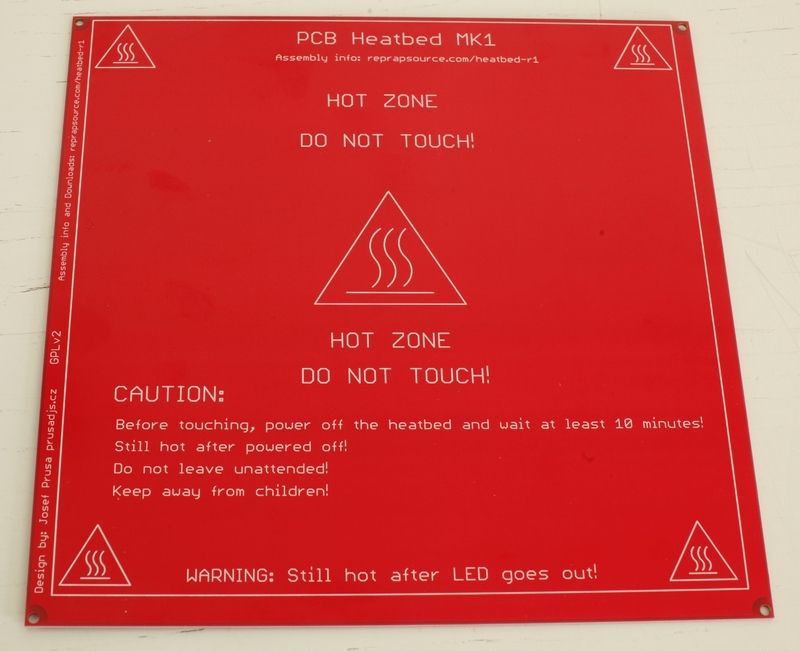 Removed the glass and am printing ABS directly on the PCB @120C. Oh... and you might want to think about putting some cardboard underneath the PCB. Will help insulate and make sure most of your heat goes up. 451F = ~233C = no worries about flames. How have you hooked the heated bed up to your Sanguinololu? I hear rumors that it's a nonstandard thing. Do your motors not skip when it's on? The Sanguinololu has a 4 pin plug designed for a heated bed platform. The 4 pins are 2 GNDS and 2 12v lines. There are 4 lines as the plug isnt designed for massive 10amp cables. I just run these in 4 in parallel to a screw terminal, on the other side of the screw terminal the I connect the two GNDS and two +12 into single 15 amp wires for the bed. And no issue of skipping related to the HBP, the only skipping issues ive had where a bug in Sprinter, which has long been fixed. Thanks for the info. Are you satisfied with this setup? And how long does it take for the glass to get up to 110º, (or whatever temperature you set it to)? 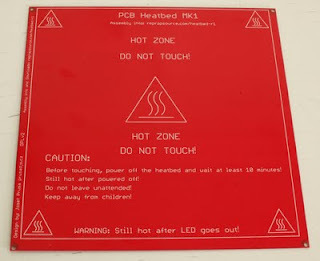 I'm scoping out heated bed solutions and PCB+glass seems popular, but I worry about the speed at which it'd heat up. It takes 16 minutes to get to the 60C I normally use it at (for PLA) It works well, but I still need to try some insulation under it so it will warm up faster! If you really need faster you can use a higher voltage with a solid state relay to turn it on etc. People have tried a high voltage that 12 for everything, and the electronics will take it, but this resulted in a melted makergear hotend! As the firmware couldnt handle the hot end getting that hot that fast.